Chile’s official language is Spanish. If you want to be able to speak with a Chilean, use Spanish. Chileans, like many Latin Americans, speak Spanish as their primary language. When asked what language they speak, Chileans will often respond “Castellano” or Castilian instead of “Español.” Chileans have adapted Spanish with their own slang and manner of speaking. Chile is known for having created an enormous amount of distinct words and expressions. 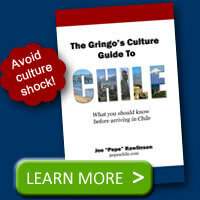 Consequently, the Spanish spoken in Chile is frequently indiscernible to gringos and native Spanish speakers alike. This dictionary and phrasebook collects more than 1,500 terms and idioms, known as chilenismos, and expresses them in simple English. The book also explores the roots of chilenismos and explains the grammatical constructions and idiosyncratic speech patterns particular to Chileans. In addition to the large collection of Chilean slang, here are some speaking habits most often used in informal situations. The Chilean people aren’t afraid to share their opinion and thoughts. Ask someone what they think, and they’ll tell you without any sugar coating. You don’t even have to ask sometimes to get them to share their opinion. A good example of this would be Chileans’ reaction to the way I spoke Spanish. After being in Chile for almost two years, I’d talk to one person and they’d tell me my Spanish was awful. I’d go next door and they’d say “wow, your Spanish is great.” Or if I hadn’t seen someone in awhile, they would never hesitate to comment on how much weight I’d gained or lost! The English language is taught in schools and is the language of international business. The English taught in grade schools isn’t really enough for fluent conversations with a native English speaker. If you will be visiting heavy tourist spots, odds are your guide or those with whom you interact will speak enough English to get the point across. Southern Chile has several areas with rich German heritage. You may find some people here that speak German. Chile does have some indigenous residents that have preserved their native languages. These people are found in the extreme north and southern parts of the country as well as on Easter Island. 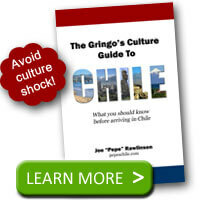 Read more about Chilean Spanish and its usage in daily life in the Gringo’s Culture Guide to Chile.